The handheld Brother PT-2460 P-Touch is a versatile labelling machine ideal for indoor or outdoor use. For convenience, a wrist strap handle is available for the Brother PT-2460 label machine. This device is lightweight yet offers excellent features, including a high memory. The only downside is that its cutter isn’t automatic. For easy gripping of the Brother PT-2460 portable label printer, it has a rubber grip and weighs only 560g. It measures 130 x 235 x 79mm, making single-hand use possible. 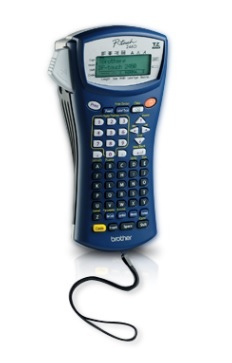 There are 56 keys on the Brother P-Touch PT-2460 handheld label printer, which includes an ABCD key, on / off function, and 1-0. This machine can handle original Brother PT2460 label tape cassette sizes of 6, 9, 12, 18, and 24mm. A manual cutter and tape cut pause as well as battery slots are on the Brother PT-2460 labelling machine. To save battery life, the Brother PT2460 will automatically power off after 5 minutes without use. This device has a large memory that can save up to 2,000 characters. Different barcodes can be delivered and up to 7 lines can be printed on a label. Other features of the Brother PT-2460 label maker include mirror printing, auto numbering and 15 kinds of frames. This handheld PT 2460 labelling system can deliver long-lasting and durable labels using Brother TZe tape cartridges. A resolution of 180dpi is offered along with a print speed of 10mm / sec. PC connection for the PT-2460 label printer isn’t offered. This device also uses a manual cutter. Although the Brother PT2460 offers 5 character styles and 7 character sizes, only 1 font is built-in. The LCD display of the P-Touch 2460 labeller could be larger for easier operation.